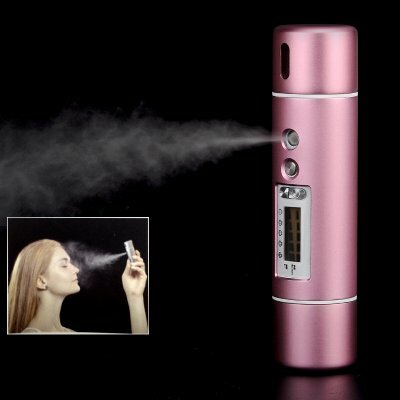 Successfully Added Portable Nano Replenishment Skin Tester - Rechargeable, LCD Display, Analyzes Skin Condition, Moisturizes Skin (Pink) to your Shopping Cart. Keep you skin smooth and well-moisturized with a portable nano skin replenisher and tester. The mini beauty gadget is super easy to use and can accompany you when you travel. Pollution, long working hours, grabbing a quick bite on the go and stress over deadlines all affect your look — and, especially, your skin. Don't want to show up to a meeting or dinner date looking tired? Don't worry – with the nano replenishment skin tester, you won’t have to. This compact handy beauty device will not only moisturize your skin, getting rid of dry patches, but also give you a refreshed and glowing look, no matter the schedule. Using ultra high speed vibration technology, the skin replenisher infuses the layers of your skin with ultrafine water particles, that let your skin preserve moisture and maintain elasticity. All of this, without damage to your makeup, so you can use the skin tester anytime throughout the day. Adopting the latest bioelectrical impedance analysis measurement (BIA), the beauty tool measures and analyzes the condition of your skin and tells you grease and moisture content, whether your skin is soft or needs some additional treatments. The Portable Nano Replenishment Skin Tester comes with a 12 months warranty brought to you by the leader in electronic devices as well as wholesale health and beauty gadgets.. I have used aftershave lotion in it and it lets me refresh the lotion during the day without the overpowering strength of splashing it on from the bottle.